PART I. INTRODUCTION 1. Environmental Conditions for Aquaculture in Japan. 2. Aquaculture and the Fisheries Industry in Japan. PART II. FRESHWATER AQUACULTURE 3. Chum Salmon (Oncorhynchus keta). 4. Rainbow Trout (Salmo gairdneri). 5. Indigenous Trout, Yamamc (Oncorhynchus masou ishikawae), Amago (rhodurus macrostomus) and Iwana (Salvelinus pluvius). 6. Eel (Anguilla japonica). 7. Ayu (Plecoglossus altivelis). 8. Common Carp (Cryprinus carpio). 9. Grass Carp (Ctenopharyngodon idella) and Silver Carp (Hypophthalmichthys molitrix). 10. Goldfish (Carassius auratus). 11. Tilapia (Sarotherodon niloticus). 12. Freshwater Pearl Mussel (Hyriopsis schlegelli). Terrapin (Trionyx sinensis). PART III. MARINE AQUACULTURE 14. Red Seabream (Pagrus major). 15. Yellowtail (Seriola quinqueradiata). 16. Flatfish (Paralichthys olivaceus). 17. Coho Salmon (Oncorhynchus Kisutch). 18. Kuruma Prawn (Penaues japonicus). 19. Scallop (Patinopecten yessoensis). 20. Oyster (Crassostrea gigas). 21. Pearl Oyster (Pinctada fucata). 22. Abalone (Haliotis (Nordotis) discus). 23. Sea Squirt (Halocynthia rorentzi). 24. Green Turtle (Chelonia mydas). 25. Nori, or Purple Laver (Porphyra yezoensis). 26. Wakame (Undaria pinnatifida). APPENDIX Appendix A Rotifer (Brachionus plicatilis) Culture Techniques. Appendix B Formula Food. Appendix C Development of Marine Ranching. Appendix D Biotechnology in Aquaculture. Index. Fish farming has increased in status equal to cattle farming as a source of food for mankind. In developing countries fish and shellfish provide inexpensive animal protein, while in developed countries aquaculture is expected to produce more fish and shellfish as a source of low-calorie protein for health conscious individuals. In such an era, knowledge of fish farming technologies of different countries, strongly influenced by cultural factors, is of valuable importance. The primary production techniques of fish farming in Japan described here have an emphasis on practical technology. 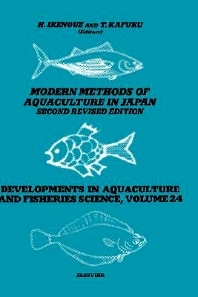 This second edition reflects the changes in both quantity of production and technology in Japanese aquaculture. The statistics have been revised and the text rewritten to suit the current status of aquaculture in Japan; new aquaculture species have been included and discussions on marine ranching and biotechnology for aquaculture added.